[Food review] More than just great coffee and food at CRP 45 Wellness & Cafe @ Sri Petaling. Where is the best place to catch up with a long old friend? Of course treating your friend to a place with great coffee and with comfortable and cozy environment. A place like home, best for a long chatting. Today I am going to meet a friend who i haven't met for few years. 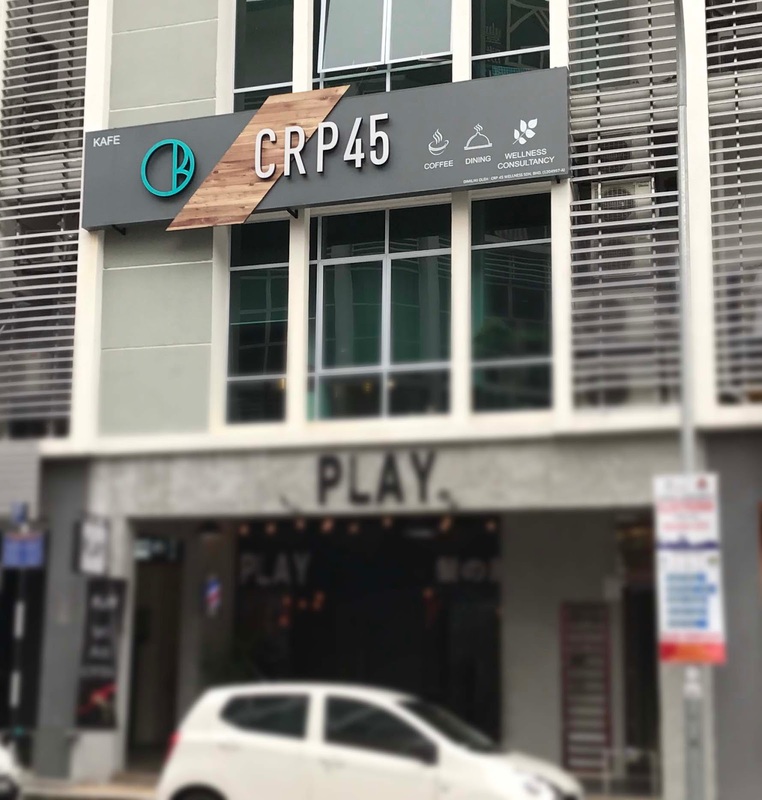 Thanks to my friend Lenny for inviting me to your cafe - CPR45 which is located at Sri Petaling, it is pleasent to try your coffee and food. Love it very much!!! Below are some the chef's signature dishes that recommended by my friend Lenny. This thick and creamy carbonara sauce cook with bacon and sprinkle of black pepper has a robust flavor and is simply tempting. Tuck into the 'must-try' signature salad that comes with fresh hand-picked tomatoes and juicy cucumbers garnished with crushed Umeboshi, topped with raisins and sesame seeds. This is one of my favorite salad. MUST TRY!!! Calling all pork-lovers!!! We are bringing you a new twist to the average pork by uniquely combining Western and Asian fusion. Yup, I pick the homemade "Yam cake" (RM 15.90) as my mouth watering dessert. CRP 45 cafe beside serving espresso machine coffee, they also offer hand brew coffee with the V60 and Syphon. Beside hand brew coffee, CRP serve some of the best coffee bean from world such as Bolivia, Brazil & Columbia. I am lucky to able to try another best coffee bean from YunNam. Actually i m not a frequent coffee drinker, as i always prefer tea instead of coffee. Well, this hand brew coffee really surprise me when a sip of this coffee will turn your eyes big and "WOW"... yes, it is WOW!!! Hand brew coffee taste different, it is smooth and yet a bit of sourich when it slowly slip down into my throat. Once you had the first cup, you will crave for a second cup. Now i understand why coffee can be addictive. Some brief story and origins of the coffee beans here introduce by the barista. Grown and processed at ManLao River Plantation's higher elevation area called “Man Zhong Tian”. At 3600-4600 ft. elevation, the land is characterized by more shade, producing denser fruit. The beans here mature slowly. Harvest starts only in early-mid December and and matures from February to until May. Processing is carefully done in small lots. This coffee has subtle sweet notes, with a tea-like floral/herbal fragrance. Every year the farmer made a small lot of what is called "Miao Man" (translated: the wondrous and the select). It's a small lot of what they think is the best or the favorite of the season. Hand-picked and from the most beautiful fruit - with beautiful being determined by the lucky person selected to organize the MianMan production. Usually hand-processed, these demonstrate the flavor of the mountain. Fazenda Rainha Farm is managed by José Renato G. Dias, an agricultural engineer with a specialization in coffee production. The farm is comprised of 280 hectares of which 200 hectares are planted with mostly Yellow Bourbon, some Icatu, Yellow Catuaí, Mundo Novo, and Acaiá. It is BSCA and Utz certified. Coffee is processed at peak ripeness with handheld mechanical picking equipment over a cloth to avoid contract with the ground. After being harvested, the coffee cherry is pulped and spread on courtyards for drying. The coffee is dried slowly in the sun until reaching 11% humidity. After drying, the coffee is conditioned in wooden graineries. All of Fazenda Rainha's employees reside on the farm and they are provided with health plans and unlimited hospital care. Fazenda Rainha has been a finalist in Cup of Excellence Brazil in 2000, 2001, 2005, 2006, 2008, 2009, 2010, and was awarded first place in the 2011. Amidst the unbelieveable landcape at Fazenda Rainha is a chapel designed by the renouned Brazilian architect Oscar Niemayer, and built by Fazenda Rainha's workers. The Chapel was one of Niemayer's last projects before he passed, just before turning 105 years old in December of 2012. It is great to meet a old friend and i manage to have a long chat while having great coffee and food. Too bad i have small tummy, unable to try all of the great food in the menu. I will visit the cafe again, it is definitely worth it. Why not you too visit the Cafe and try out their coffee and food, and most important learn more about how to improve your health in 45days.